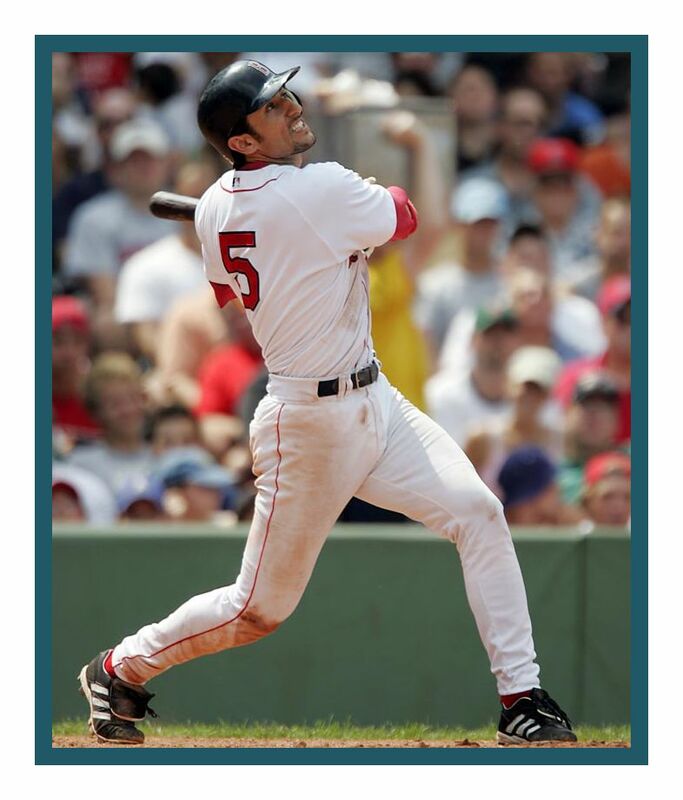 Anthony Nomar Garciaparra was born on July 23, 1973 in Whittier, California. His parents, Sylvia and Ramon, ran a print shop in town. Nomar, of course, is Ramon spelled backwards. By the time “Anthony” picked up his first bat and glove, everyone was calling him Nomar. Nomar was the star of his youth league baseball, soccer and football teams. He always went for number 5, from his earliest days in Little league. By middle school, he was far ahead of the other hitters his age. Ramon, who knew every nuance of his son’s game, believed he could play at the highest level of amateur baseball. When Nomar was 13, his father had him hit against a Division I college pitcher who threw 90 mph. Within three swings, Nomar had timed him and was drilling the ball back up the middle. Nomar enrolled at St. John Bosco High School in nearby Bellflower in 1986. He quickly became the stud of the baseball and soccer teams, and was also the kicker on the football team. He could split the uprights from 50 yards. As the years passed, it became clear that baseball would be Nomar’s ticket. College and pro scouts were watching him regularly by the time he was a junior, and after a stellar senior season he was drafted by the Milwaukee Brewers. Among Nomar’s scholarship offers were ones from UCLA and Georgia Tech. It was tempting to stay close to home, but something told him that he would be happier as a Yellow Jacket. He joined a school that had been building a solid program, but had yet to make the College World Series. The the team, which was coached by Jim Morris, starred catcher Jason Varitek. When Nomar showed up at his first practice at Tech, he could easily have been mistaken for a water boy. Barely six feet tall, he weighed a mere 135 pounds. His fellow Jackets weren’t sure he would survive the 1992 season. Morris told Nomar if he played consistent defense he would stay in the lineup. Not only did Nomar pick it at short, he became the club’s best clutch hitter. as a freshman. He batted .363 with 51 RBIs and 23 extra-base hits to help the club go 45-19 and gain a Top 25 ranking. At season’s end, he was named to the Freshman All-America Team, and was honored as ACC Rookie of the Year. Late in the season, Nomar wowed Miami coach Ron Fraser. Fraser had already picked the team he planned to take to Barcelona to the Olympics, but urged Nomar to attend a walk-on camp that summer. Nomar outshone 100 other college stars to become the first true freshman ever to suit up for Team USA. A bench player during the team’s summer tune-up tour, Nomar hit his way into the lineup, supplanting All-American Michael Tucker at shortstop. Although the Americans failed to medal, Nomar still thought the Olympic tournament was the greatest thrill of his young life. In 1994 Nomar went wild. He batted .427 with 16 homers and 73 RBIs, and finished second in the country with 213 total bases and third with 92 runs. Varitek also had a great year, and outfielder Jay Payton put up solid numbers to propel Georgia Tech into the College World Series. Nomar was an Academic All-America as well. A Business Management major, he was on course to graduate, but the lure of pro baseball was too strong. This was especially true when he was drafted #12 by Boston and offered $895,000 to leave school. He joined Class-A Sarasota for 28 games, then moved on to the Arizona Fall League. The Red Sox wanted to gauge how far along he was defensively. Nomar exhibited great range, particularly to his left, and a strong and accurate throwing arm. The team was convinced he could contribute in the big leagues within a couple of seasons. They just needed him to beef up a little. This was easier said than done. Despite a glorious 1995 campaign at Class-AA Trenton, Nomar could not get his weight up over 160. After the 1995 season, Nomar was exhausted. His weight was down below 160 and he wondered whether he had the stamina to make it the majors. He got in his car and drove to Bradenton, Florida, where he talked with his old Georgia Tech trainer, Mark Verstegen. Verstegen explained that Nomar had to remake himself, starting with his core muscles. These were the ones he depended on for hitting and throwing. Three months later, he had packed on nearly 20 pounds of raw muscle between his belt and neckline. In spring training, Nomar’s new body turned a lot of heads—including those of outfielders who had to chase down his long line drives. Camp followers thought he might be a big-leaguer by season’s end until he tore a muscle in back of his left knee sprinting to first base. The injury kept him out until July, and he had to re-start at Class-A level. His bating stroke came back quickly, and soon Nomar was smacking the ball around Triple-A ballparks with Pawtucket. At the end of August, with a .339 average and 16 homers in 186 at-bats, Nomar was called up by the Red Sox, who were in a four-way battle for the AL Wild Card. He homered in his first start, and later Boston moved shortstop John Valentin over to second to keep the youngster's bat in the lineup every day. As most rookies do, Nomar struggled against major-league breaking stuff. But he continued to play hard and work with the coaches until he gained a measure of confidence at the plate. In the season’s final six games, Nomar smashed three homers, including an opposite-field job at Fenway Park that cleared the bullpen. Boston fell short of the playoffs, but Red Sox fans had a lot to talk about that winter with their new power-hitting shortstop. The 1997 season found Nomar at short and Valentin at second full-time. The veteran was not pleased about the development, but was a class act about it, helping Nomar in the field all year. The move ignited the entire team. Nomar was fantastic. A ninth-inning game-winning homer against the Seattle Mariners in early April began an offensive onslaught that saw the young shortstop go into the All-Star break with 13 homers and a .291 average. He made the AL squad, and the day before the game he won the Home Run Derby, depositing 13 balls into the stands. After the break, he continued his torrid hitting, setting a league record with a 30-game hitting streak. The Red Sox stayed competitive most of the season, but when cleanup hitter Mo Vaughn went down with a bad knee, there simply wasn’t enough outside of Nomar to challenge the New York Yankees and Baltimore Orioles in the East. Nomar finished the season with 30 homers—a record for rookie shortstops—and obliterated Harvey Kuenn’s all-time mark of 85 RBIs by a leadoff hitter with a robust 98. He also broke team marks held by Williams (for total bases) and Johnny Pesky (for hits) by a Red Sox first-year player. Nomar ended up leading the AL with 209 hits, 684 at-bats, and 11 triples. His 365 total bases were second in the league. Defensively he was just as good. He made highlight-reel plays without screwing up the easy balls, and topped the AL in total chances, putouts and double plays. That fall, Nomar became only the fifth unanimous choice for AL Rookie of the Year. After the season, the Red Sox tore up Nomar’s contract and raised his salary to $4 million a year. The big news in Boston for 1998 was the signing of free agent Pedro Martinez. The Red Sox had floundered since losing Clemens, who was now winning Cy Young Awards with the Blue Jays. Pedro gave them a go-to guy on the mound. Meanwhile, Nomar was the go-to guy at the plate and in the field. He was playing even better than he had the year before. During a May game that the Red Sox were leading by 10 runs, Nomar dove for a grounder and separated his shoulder. The fans were outraged that he would injure himself on a meaningless ball in a game that was already won, and scared that he might not recover to full strength. Within a week, Nomar was back in the lineup, and later in the season went on a 24-game hitting streak. He also reached 30 home runs again, making him just the fifth player to do so in his first two full seasons. Heading down the stretch, the Red Sox were in a battle for Wild Card. In the final two weeks, Nomar hit four homers and scored 13 runs. Two of those dingers came in the game that clinched a playoff berth. Nomar finished the year with 111 runs and 122 RBIS, 35 homers, a .584 slugging average, and a .323 batting average. A loud cry of protest when up in Boston when Juan Gonzalez of the Texas edged him for the MVP award. In the all-important second half, Nomar had out-homered the Rangers slugger 22-19 and driven in 10 more runs. Perhaps the most impressive part of his year was his consistency. He batted .324 on the road, .322 at home, .320 against lefties and .324 against righties. The 1999 campaign saw the Red Sox with a depleted roster, thanks to the free agent departure of Vaughn. Nomar was now the undisputed star of the team, and he carried a so-so club into the post-season with 90 wins and another Wild Card slot. Slowed down by a wrist injury in the final month, he still managed to lead the league with a .357 batting average. He clubbed 27 homers and knocked in 104 runs despite having virtually no protection in the lineup. Limited by an aching wrist, Nomar could do little to keep the Red Sox from losing the first two games of their playoff rematch with Cleveland that fall. The pain was so bad that Nomar had to sit out Game 3. He watched proudly, however, as his teammates rallied to defeat the Indians 9-3. Nomar returned in Game 4 to spark a 23-7 shellacking that evened the series, then drilled a two-run shot to open the scoring in Game 5. In the third and seventh innings, Nomar was walked intentionally to load the bases. Each time, journeyman Troy O’Leary blasted grand slams on the way to a wild 12-8 win. With the World Series within reach, the Red Sox had to deal with their nemesis, the Yankees. Boston’s depleted pitching could not hold back the New York offense, and Boston fell four games to one. The Red Sox renewed their attack on New York in 2000, and in the early going Nomar’s bat and Pedro’s arm kept them in the hunt. The bright light in an otherwise dim season was Nomar, who turned in another fabulous campaign despite being nagged by his old wrist injury. Again, he saw almost nothing to hit, but batted .372 nonetheless to capture his second straight batting championship. The arrival of Manny Ramirez in 2001 promised to change the balance of power in the AL East, as the aging Yankees looked ripe for the picking. The season did not play out that way. Although Ramirez hit as advertised and Nixon had a productive year, Nomar, Pedro, Everett and Varitek all missed major time to injuries. The 2002 campaign was supposed to be Boston’s clean slate year. The Boston offense was back on track, with Nomar hitting .310 and leading the league in doubles, and Ramirez winning the batting title. All of this went to waste, however, as the Yankees won consistently all season and the Red Sox could never close the gap. Although Boston tallied 93 victories, it still left them 10.5 games back—and wasn’t even good enough for the Wild Card, which went to the eventual world champion Anaheim Angels, who won 99. Boston finally returned to the postseason in 2003, snagging the Wild Card with 95 wins. Their offense was bolstered by DH David Ortiz and surprise batting champ Bill Mueller, and included excellent years from Ramirez, Nixon, Varitek and Damon. Nomar contributed 28 homers, 105 RBIs, 19 steals and a .301 average, as he went through another healthy and productive season. He and Carlos Beltran were the only players in the AL to reach double figures in doubles, triples and home runs. In Game 7 of the ALCS and a 5-2 lead in the 8th inning, Grady Little tried to squeeze a few extra outs from his ace and paid the price, as the Yankees knotted the score and won the pennant on an 11th-inning homer by Aaron Boone. Of the many soul-crushing defeats at the hands of the Bronx Bombers, this might have been the worst. It didn’t help that Nomar produced just one RBI during the series. After the '03 season, the Red Sox had some tough financial decisions to make. Ramirez’s contract was crippling the team, and Nomar was due a major raise from the $6.5 million he was making. The economics of baseball had changed, however. When Nomar and Tellem sat down again the Red Sox, the club had lowered its offer to $12 million per year. Nomar was not a happy camper. Adding insult to injury, Boston attempted to pull of a four-way deal that would have sent him to the Chicago White Sox and Ramirez to Texas in exchange for Alex Rodriguez. The deal appeared to be done when the Player’s Association stepped in and refused to let A-Rod restructure his contract with the Red Sox. For better or worse now, Nomar was still in a Boston uniform. At times, the 2004 Red Sox still seemed to be reeling from their Game 7 defeat the previous fall. 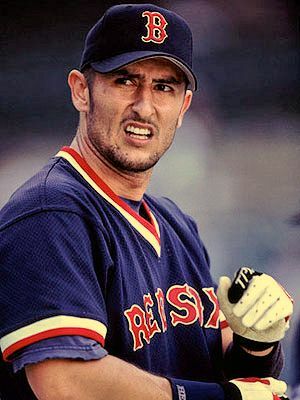 Nomar missed the first third of the season with a sore Achilles heel, and when he came back he was often criticized for what the fans perceived as a lack of toughness. A hero from the day he moved into Fenway, Nomar was suddenly the scapegoat for the team’s problems. In a crucial game against the Yankees that summer, Nomar was a conspicuous DNP when Jeter dove headfirst into the stands for a foul ball. To many, this summed up the difference between the two players, and the two teams. It wasn’t long before the Red Sox, looking to shake things up, dealt Nomar to the Chicago Cubs.